Home Local news Dino Melaye Causes Confusion In Senate, ‘Decamps’ To PDP? 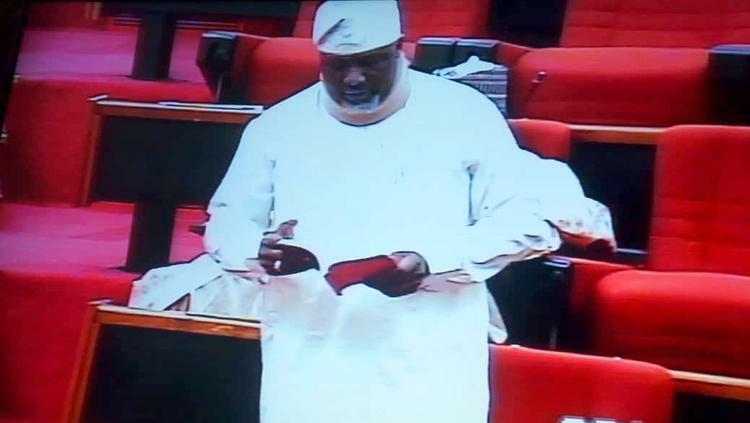 Dino Melaye Causes Confusion In Senate, ‘Decamps’ To PDP? Senator Dino Melaye who has been 'bed-ridden' since he landed in the hospital after a failed attempt to evade being taken to Kogi State by the Nigerian police, took actions that threw the Senate into a rowdy session. The lawmaker, raising a point of order on Wednesday, thanked his colleagues, members of the House of Reps, his constituents and the Nigerian populace for standing by him during his travails with the police. He also took his time to thank the leadership of the People’s Democratic Party (PDP) for their support. Mr Melaye, who attended the chamber with a neck support, also asked the Senate President, Bukola Saraki, to mandate the sergeant-at-arms to create a seat for him at the opposition wing of the chamber. Thereafter, he announced he would sit beside former Senate President, David Mark, pending the time a seat will be allocated to him. “I have a special request to you Mr President,” he said. “Because of the trauma I went through and I’m still going through, I want to seek your indulgence that you will call on the Sergeant-at-arms to look for a comfortable seat for me on this side of the divide (pointing to the opposition wing) because I am no longer comfortable sitting here. So, I want to ask the Senate President that you mandate the sergeant-at-arms tomorrow to look for a seat for me on this other divide of the chamber. His colleagues perceived a suspicion that he had concluded plans to decamp to the PDP. Mr Melaye thereafter moved to the opposition side to sit beside David Mark. PT reports that Melaye’s movement was greeted by rowdiness among lawmakers at the Senate floor with those who spoke later expressing mixed reactions. The PDP senators spoke in favour of his move while APC senators tried to prevent his movement. The Senate President, Bukola Saraki, granted his immediate prayer of sitting beside Mr Mark for the day while noting that his request for a permanent seat at the opposition wing will be looked into. But the decision didn’t go down well with APC senators. First to oppose was the Senate Leader, Ahmed Lawan, who said Mr Melaye’s movement without proper allocation negates Order 56 (3) of the Senate. He requested the chief whip to bring Mr Melaye back to the APC wing of the chamber. Next was the Deputy Senate President, Ike Ekweremadu, who argued that Mr Melaye’s action was borne out of his welfare and right to exercise freedom. He urged APC senators to respect the action. Godswill Akpabio, the Senate Minority Leader, said the movement is not about party allegiance. He said the PDP is willing to accept any APC senator who wishes to cross. “Where we are now is the Nigerian Senate. Whether to the left or the right. At any point in time that any senator on the left feels that his or her seat is not comfortable. He is welcomed here. I want to welcome Senator Dino here. We are the ones that should have complained, but we are not complaining. We must be our brothers’ keepers,” he said. Amidst rowdiness still, Barau Jibrin (Kano-APC) said the National Assembly is empowered to regulate its proceedings according to section 60 of the constitution. He prevailed on the Chief Whip to return Mr Melaye to his seat pending the time he is allocated another seat in accordance with Senate rule. “The order of the Senate clearly specifies that every senator shall sit on a seat that has been assigned to him by the Senate President. Therefore, the position canvassed by the Deputy Senate President does not hold here because it is against the Nigerian constitution. Also in defence of APC senators, the Chief Whip, Olusola Adeyeye, urged Mr Saraki to avoid setting a bad precedent by allowing the change of seat. “The qualification of any member of the National Assembly is that he be a member of a political party. In the Senate, seats are assigned based on membership of a political party. Saraki however defended his position noting that Dino Melaye did not at any time mention that he wanted to defect to another party. “I don’t think at any time in his contribution the issue of change of allegiance or party ever came up. It’s not an issue that has come up today at all. He talked about his state of mind and comfort. None of us has been through what he has been through neither do I think the rules have ever foresaw this kind of situation. As part of our spirit of giving support, we will accommodate his request..."